They use an excess resource of tyres and are quite easy to construct. They cost little money to set up as the plants that fill them are easy to procure from the wild or easily propagated once purchased from an aquatic nursery. Below I will flush out the design as well as the process one would take to implement this simple design feature. Your design will be based on the size of tyre that you can find lying around. We want to source larger tyres, like those from a tractor or large truck. This will determine the size of the inner and outer rim as we aim to create edge within the small pond to create even more niches and the subsequent biodiversity. 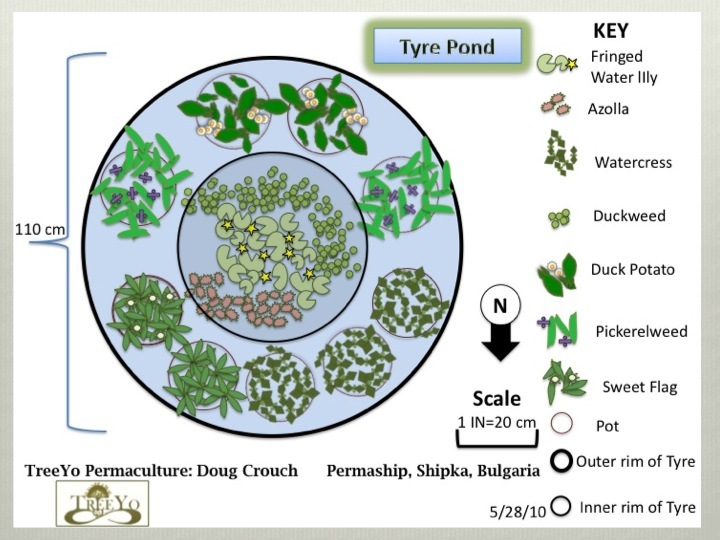 Once you have those measurements, you can determine approximately how many plants will fill the tyre pond and where to locate it within the garden. I like them on the edge of zone 1 and 2 depending on other aquatic resources around. If you have a zone 2 aquaculture pond, locate the tyre pond near the annual garden bed in Zone 1 to help with insect predation. Alternatively you may be just growing duckweed on top of the pond for the chickens to eat. Then you want to put it in relative location of the chicken coop. 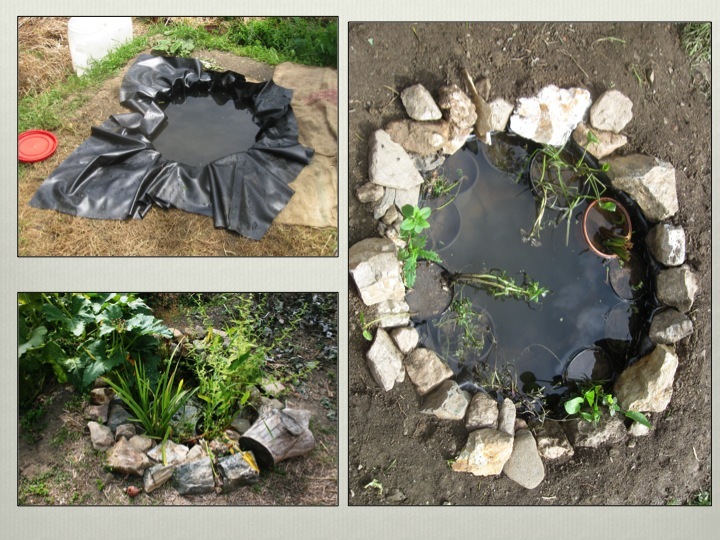 You can also create multiple tyre ponds to fit the desire of how much space you want in water and what functions they will be fulfilling. After the observation and design process occurred, the implementation process goes relatively smoothly. First you must cut the top rim of the tyre off to create the shelf shape that we desire. This is easier said then done these days because of steel-belted tyres. We had an old pruning saw that was on its last leg that we used numerous times for this in Bulgaria. Don’t use anything nice and plan to have this process last a couple of days and work at it slowly. A bit of soap helps with the lubrication and cutting process. Once you have that done then you locate the tyre and start digging. Digging the inner rim, laying the hessian sacks, and the plastic lining initially going in. another 25-35 cm down. Some I have gone deeper on but it doesn’t seem to provide too much benefit. 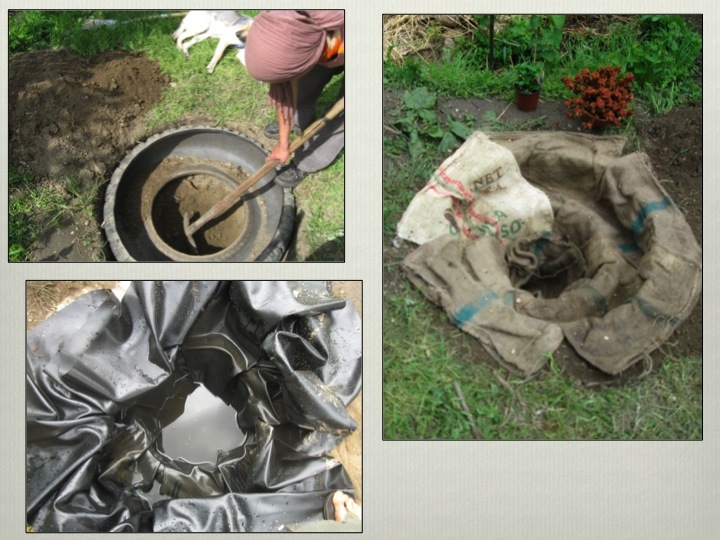 Once you have the earth removed, replace the tyre in and then you need to line the hole and the tyre with either hessian sacks or old carpet. This provides a barrier between the steel of the tyre and any other jagged obtrusion such as stones. From here you are ready to lay the plastic down. We typically use the same lining of plastic that is available for green roofing. It is widely available these days and a tough and some what stable plastic fiber. However, it is full of what is called plasticizers and these must be processed before laying it. To eliminate there is two different ways based upon timing. One is to use soap and lots of water to thoroughly rinse the material away. This is the quickest way and if you need the job done immediately, this is the way. Alternatively, you can leave the material in the sun for several days and you will notice the strong smell of plastic fades after three days. A combination of the both is probably the best in the end. Once washed then you lay the plastic in the hole. A tip for laying the plastic is do it midday on a sunny day. That morning lay out the plastic in the sun and find some gloves that you can use. This material is much more pliable when warm and allows you to more quickly smooth out the majority of the wrinkles. You never will get all the wrinkles out and the folds act as refuges for small insects. The pressure and weight of the water will further assist in the laying out process. I recommend using non-chlorinated or chlorimated water in the beginning but adding a handful of good worm or hot compost can help neutralize these chemicals through the humic acids that are held within. I always recommend that you add water from a local pond as well as some pond bottom muck. This will help to inoculate various forms of life and begin the nutrient cycling. 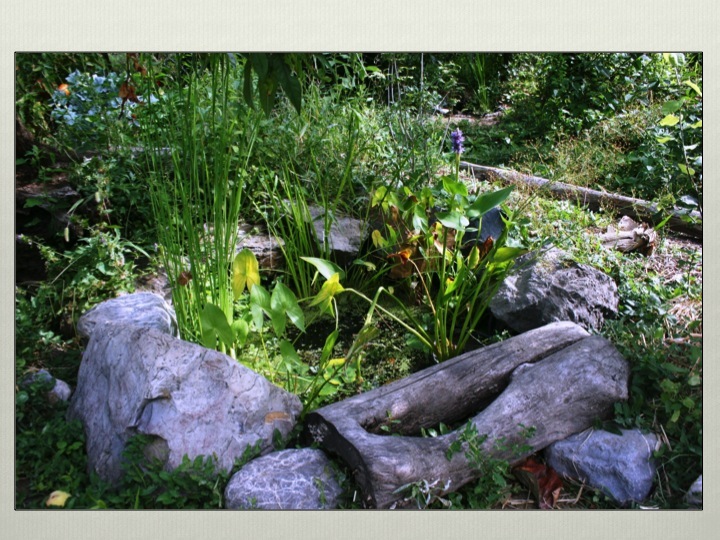 From there you can put the plants in the pond in a couple of different ways. One way is to create a plant medium similar to potting mix with compost, pond bottom soil, and sand and keep the plants in pots on the shelves. This allows you to control a bit the size of the plants as many aquatic plants are quite aggressive. Besides that you can fill up the pond shelves with 2-4 inches (5-10 cm) of the same sort of mix and plant directly into that. I used the plants in pots where I am looking to start more of a nursery type situation but in a more stable location I use the soil directly on the shelves. The ponds respond quite quickly and the above one that you see is only a few months down the road from its initial creation. The plants respond quite well to transplant and when planted in mostly full sun with some afternoon shade, they thrive. Logs and stones enhance their look and habitat creating ability. Furthermore, make sure you have an entry and exit for the frogs. This element can serve many functions and is quite easy to install. 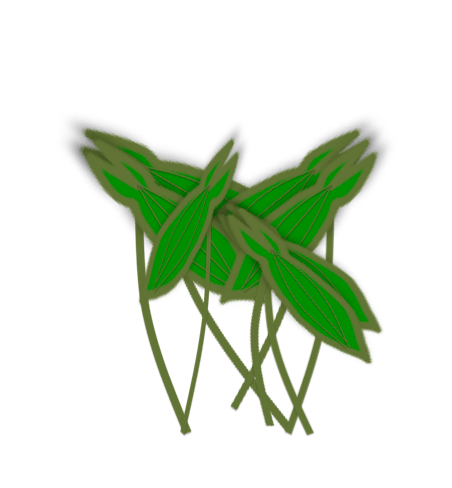 Below is a list of plants that you see in the above pond just as an idea of the amount of biodiversity that is possible in such a small area of slightly bigger than one meter around. Hey guys just building a tyre pond at the moment, great resource thank you! How did it go, i am glad it helped, feel free to email me a pic of the final product and i can post it, eh. Thanks! Is there a way to use clay or concrete as the liner? Have tried plastic and keeps on getting a small hole or rip! For clay, bentonite clay is the best option, still needs to be compacted. Concrete is definitely an option but will crack over time. With the plastic did you line the bottom before putting the plastic down? That should be done with coffee sacks (jute or hessian) or old carpet. This prevents the rocks from pushing up through the compressive force of the waters weight. Bentonite clay – thank you so much for the tip. Have used concrete in the meantime but will be building more of them and now know what to use! Hey im wondering is it possible to tier this pond? I want to make it about 3 tires big and we live on a slop? could we use a pump just to keep water going through? I am really not sure if you could tier it but i don’t see any reason why not. As long as you have the spillways aligned and the pump all in order it should be like any other plastic lined pond that falls. Have you ever seen/heard of anyone doing this without a tire to establish the base shape? My soil is quite dense with lots of clay. Is there any reason you can see why I wouldn’t be able to just dig a shape out? thanks for the feedback, yeah some shade is good especially if you want it to be lower maintenance. you will always have to manage the plant layer especially since it is a small space. but that is the abundance of water and nature so it will provide you with mulch material and plant material for propagation. you may want to add or subtract over time different plants so keep that in mind. Sorry i don’t have any off the top of my head but looks for those that flower, have unique colors or scents. 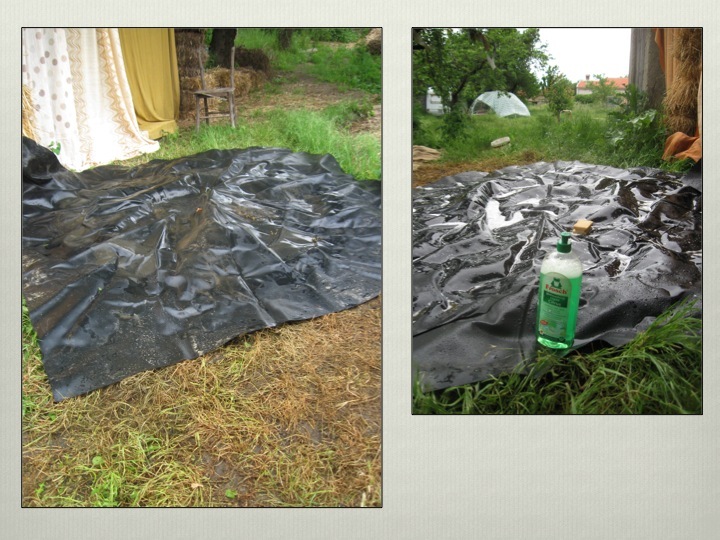 What about water evaporation in the tyre pond?